BECKLEY, W.Va — Trey Doomes already knew what to look for, having played against Jordan McCabe a number of times in AAU basketball since the eighth grade. The guys practicing with McCabe for the Scott Brown Memorial Classic weren’t clued in. 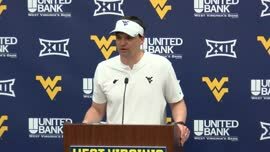 “Yeah, he caught a lot of guys in the head who weren’t ready for his passes,” said Doomes, a West Virginia signee who played on the No. 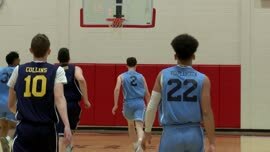 2 high school team in the nation as a senior — NSU University School, in Fort Lauderdale, Fla.
Doomes and McCabe played together for the first time Saturday, in the annual Scott Brown Memorial Classic, at the Beckley Convention Center. They put on a show during pre-game festivities. McCabe, a 6-foot guard with deadly no-look passing skills, won the 3-point contest, knocking down 18-of-25 in both rounds. Doomes, a 6-1 athletic guard who isn’t afraid to defend anybody on the floor, won the dunk contest when he hauled in a bounce pass from McCabe — tossed from the upper-row seating area 40 feet away — and then threw down a double-pump jam. Doomes and McCabe’s EIN team came away with a 138-114 win. McCabe (19 points, seven assists) and Doomes (24 points, seven rebounds) were named co-MVPs. 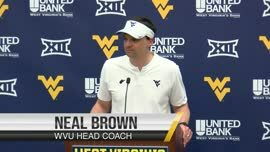 Next season they will take their acts to a WVU team in need of replacing star guards Jevon Carter and Daxter Miles Jr., but that is their future. 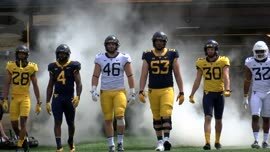 Their pasts, too, are interesting and intertwined enough that McCabe readily takes credit for fueling the mutual interest between WVU and Doomes. That was in 2016, while McCabe was working to prove he had more to his game than just flashy ball skills that once got him on The Ellen DeGeneres Show when he was a pre-teen, and Doomes was looking to find a bigger school that provided better competition and an opportunity to grow his own game. That all changed once McCabe got involved. As a senior, Doomes found the right school. The native of Acworth. Ga., transferred to NSU Universty School, which finished runner-up in the GEICO High School national tournament to Montverde (Fla.) Academy — the school former Mountaineers standout Devin Williams attended. NSU’s roster also included Vernon Carey Jr. — the nation’s No. 2 overall prospect in the 2019 class — Scottie Barnes, a five-star prospect in the class of 2020 and four-star prospect Drue Drinnon, a New Mexico signee. McCabe, too, grew his game past the little kid known for performing ball-handling tricks at college and pro games and into a player respected for his overall talent. He scored 26.7 points with 7.8 assists per game as a senior and scored on a last-second drive that handed Kaukauna the Wisconsin WIAA Division 2 state championship last month. “That whole label, I guess you could call it, on me being just a show, that’s out of here now,” McCabe said. 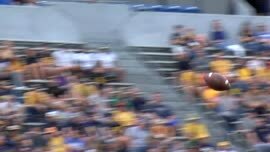 “That tag is gone now that I’m signed to a Big 12 school with a hall-of-fame coach. That kind of puts everything in the past.